(Nanowerk News) Imagine setting a frying pan on the stove and cranking up the heat, only to discover that in a few spots the butter isn't melting because part of the pan remains at room temperature. What seems like an impossible scenario in the kitchen is exactly what happens in the strange world of quantum physics, researchers at the University of Arizona have discovered. The findings, published in the scientific journal Physical Review B ("Tunable quantum temperature oscillations in graphene nanostructures"), suggest that quantum effects play a role in how heat moves through a material, challenging that classic notion that heat simply diffuses from a hot spot to a cold spot until the temperature is the same throughout. "Nobody has seen these quantum effects in the propagation of temperature before," said Charles Stafford, a professor in the UA's Department of Physics who co-authored the paper. "Heat diffusion has always been thought of as a process that you can't affect. Ordinarily, a pattern of hot and cold spots within a material would be washed out by the inexorable flow of heat from the hot spots to the adjacent cold spots." "We found that electrons carrying heat propagate as two-dimensional quantum waves," Stafford said, "and the ripples in those waves are predicted to lead to hot and cold spots that persist, flying in the face of our everyday understanding of temperature and heat flow." What's more, "the size of these ripples is controllable in graphene, so that this strange phenomenon should be observable with state-of-the-art scanning thermal microscopes, offering a unique vista into the nature of temperature and heat transport at the quantum level," the authors write. "In other words, this is not just some conceptual result, but you should be able to observe this phenomenon with current lab techniques," Stafford said. After predicting similar types of temperature waves along single molecules — too small for technological applications — in computer simulations published previously ("Probing Maxwell’s Demon with a Nanoscale Thermometer"), Stafford and his team now provide the basis for observing quantum heat transfer with available technology. 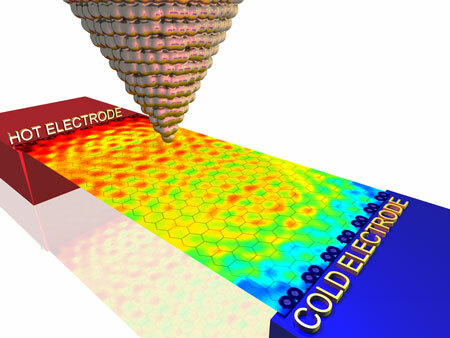 "Under certain conditions, one could make these wavelengths 20 nanometers or more, well in the realm of current resolution of scanning thermal microscopy," Stafford said. "As devices get smaller and smaller, there is a big push in technology to be able to manage temperature at a nanoscale level," Stafford said. "For example, if we want to improve processing hardware, we need to understand the flow of heat at that level, and that requires us to bring our understanding from the blackboard of theoretical physics to being recognized in a lab setting." "Through quantum heat transport, it should be possible to achieve spot cooling on the microscale level that would be impossible to achieve by classic heat transport," Stafford explained. "In a typical computing architecture of two-dimensional chips, you have to drain excess heat along the edges, and that becomes more and more difficult as everything becomes smaller and smaller. If instead of having to cool the whole structure you could selectively cool certain microscopically small processes on the chip, it would be a great advantage." Moreover, quantum effects may offer new methods to circumvent long-standing technological challenges, suggesting that the investigation of "phase-sensitive" thermal effects could open the door to quantum-engineered heat transport devices. The research was done in collaboration with Justin Bergfield, who earned his doctorate in Stafford's lab in 2010 and is now a postdoctoral fellow at Northwestern University in Evanston, Illinois; Mark Ratner, also at Northwestern; and Massimiliano Di Ventra at the University of California, San Diego.